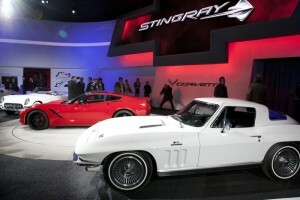 Its amazing how much interest there was in the latest generation of Corvette being unveiled. The truth is this is only the sixth revision of the car since it was originally introduced in 1953, some 60 years ago. The Corvette has always been seen as Americans great Sports Car challenge to Europe brands most notably Ferrari. The reality is however that the Corvette had come to represent the only real chance most car buyers have at attaining a world class sports car. 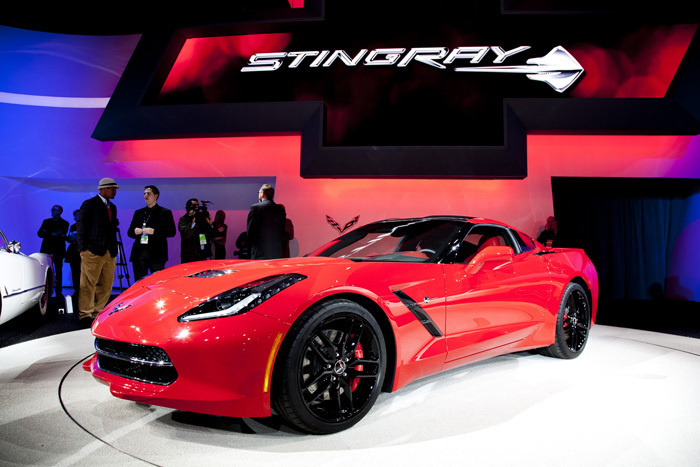 More recently Chrysler has offered the Viper and Ford is breathing more and more power into it’s Mustang but historically, the Corvette has established itself as the real North American every-man’s Super Car. The latest generation is a bit of departure from traditional Corvette design. Yes the car maintains the long hood, hatchback design of the original Stingray but the faux Ferrari round rear lights are now discarded. Chevy designers have borrowed heavily from the taillights of the Camaro with these rectangular models. GM has chosen to revive the Stingray name used on the 1960’s model that featured a split rear glass hatchback window (the new model doesn’t). I loved that model, my next door neighbor as a kid had 2 of them as daily drivers. Under the hood, C7 Corvette comes standard with a new 450 horsepower 6.2-liter LT1 V8 motor, which features a first, direct fuel injection, as well as variable cylinder activation for better fuel economy. I’m not sure anyone ever bought a Corvette to brag about fuel efficiency so thankfully the base car should still scream to 100 kms/hr in just under 4 seconds. The engine is coupled to a choice of 6-speed automatic or seven-speed manual transmissions. The overall look of the car is very European with a long hood and dramatic air ducts around the exterior. Once the domain of higher priced performance models in earlier generations, all C7 models come with an aluminum frame. Some of the body panels have been upgraded from plastic to carbon fibre to help mitigate the overall weight. An example being the carbon fibre roof panel which weight 10 kilos less than one in plastic. Oddly despite the high tech structures that bring the chassis weight down by about 44 kilos, expect the finished vehicle to weigh about 45 kilos more than the outgoing C6 model. Blame all the extra equipment added to the new model. This latest model highlights a particular problem GM faces with the Corvette. Reading through what it takes to make a world class sports car and then to produce one that looks and performs as this one does, surely is must cost more than a GMC SUV? Well not if you to believe price projections. Expect the C7 to list for between $50-60,000 in the US when it eventually goes on sale. That’s great for potential buyers but if the brand were stronger GM should be able to sell this car for more than a loaded Suburban SUV.